Scicli was the penultimate stage of my trip to Sicily, for the first weekend of November 2018. 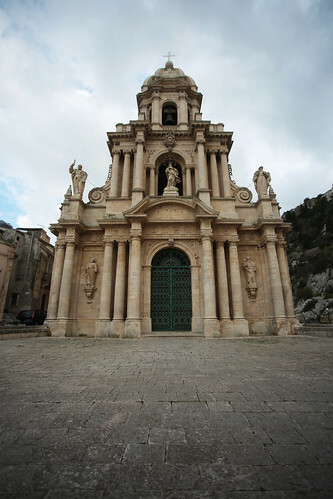 I decided to include it in my journey for two reasons: the main one is, apparently, the Sicilian baroque for which the area is famous; the second was the search for the sites of Commissioner Montalbano. A piece of advice before starting: I suggest you look for parking near Piazza Italia, where there is also the “Osteria Tre Colli” of which I had spoken in the post on useful information about Ragusa and its surroundings. Church in the typical Baroque style of the area, dating back to the fifteenth century. The church did not suffer much damage because of the earthquake of 1693 and, today is one of the main monuments of the city. Not far from Piazza Italia, I started my tour of the country from here. I had seen it from a distance, while I was looking for a place to have lunch, and I decided to get closer to take a picture. I have not visited the interior, I must admit, but even a close look outside is worth giving. Worthy of note is the altarpiece depicting the Martyrdom of St. Bartholomew by Francesco Pascucci, the Immaculate between Santi del Cassarino and the Deposition by Mattia Preti from the convent church of the PP. Capuchins. This church also houses the wooden crib, from 1573, of the Neapolitan school and attributed to Pietro Padula (the statues were, initially, sixty-five and today there are only twenty-nine). The remains of the ancient castle overlook the village, from the top of the hill of San Matteo. I was also impressed by looking at them from the bottom of Piazza Italia. It is a tower, probably the keep, of a fortified complex that in ancient times had to have a more massive structure that was then lost due to the flaking of the rocky ridges on which it was initially built. The building was built in the early twentieth century in the neo-Renaissance style, where once was the Benedictine monastery now demolished. Nowadays, it is the headquarters of the municipality of Scicli. 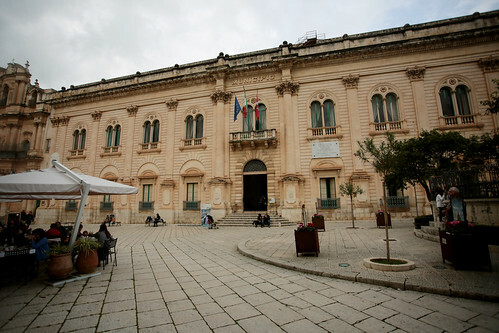 This is also the building where the Vigata police station is based, where the Montalbano police station works: this is the set actually used to shoot the series, and you can visit it by paying a ticket of 3 euros per person (there are also cumulative tickets to visit all the locations of the TV series that are in Scicli). If you love the television series, I suggest you attend at least the police station. 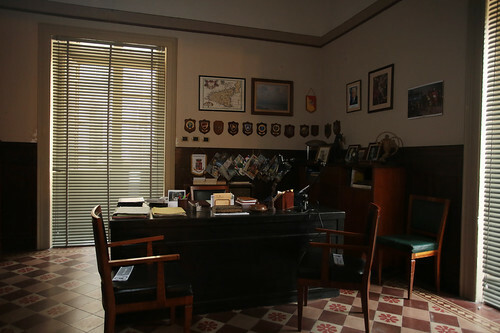 The room of the City of Scicli Mayor is the room of the Quaestor of the Montalbano tv series. Built in Art Nouveau style and opened in 1902, it is located not far from the Scicli city hall and is the pharmacy where Montalbano goes. The Pharmacy closed in 2002 when the street where it is located became a UNESCO heritage: its interior is preserved as a small museum, with shelves of the past, jars with natural essences, ampoules, flasks, scales, ceramics and the cash register. It was reopened to the public in 2014 as a “cultural site” thanks to the commitment of the “Tanit Scicli” Cultural Association. It was built during the 18th century and was owned by the Modican family Spadaro, who moved to Scicli in the seventeenth century. Its facade, in late Baroque style, develops in length according to the curved shape of the road; the internal staircase, which can also be seen from the outside, is perpendicular to the entrance door. The eight balconies of the façade are made unique and particular by their rococo bands with geometric and floral motifs, while the railings were built with a convex shape to facilitate the view of the ladies who, in the 18th century, wore very sumptuous dresses. It is located in the central square of the historic centre, next to the town hall building, “closing” the square itself. It is one of the oldest churches in the city, in the past, the church and the former attached convent were inhabited by nuns of seclusion and, despite the construction did not suffer damage due to the earthquake of 1693, was completely rebuilt. The reconstruction work began in the mid-eighteenth century, entrusted to the architect Alessi, and was completed in the mid-800, led by the architect Palermo Fama. The interior, with a single nave and characterised by polychrome decorations and countless stuccoes, paintings, frescoes and sculptures, has an elliptical plan and a semi-cylindrical apse. The interior decorations alternate with stuccos and frescoes, an alternation that deceives the eye of visitors who exchange them for majolica. The eighteenth-century floor is original and realised by the Lupo brothers, in pitch (black) of Ragusa stone and white stone of Comiso.I found information on this vital church on the cosmoibleo.com website. Among the places not to forget during a trip to the village, there is also the Chiesa Madre S. Ignazio de Loyola. Overlooking Piazza Italia, even in this case I stopped only to observe the outside (shortly after lunch, all the doors were closed). Another religious building among the oldest in the city, it was founded at the behest of the Miccichè family and the matrix we see today dates back to the seventeenth century and was a Jesuit church dedicated to St. Ignatius of Loyola. 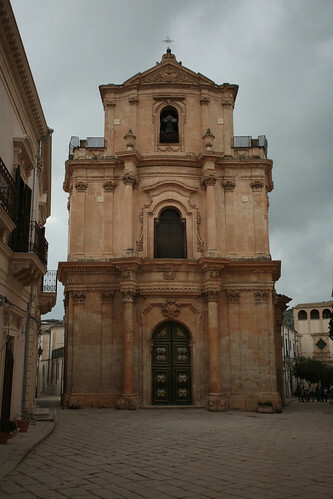 When Sicily was hit by the earthquake of 1693, the church was still under construction and was severely damaged and rebuilt in 1751. More than 100 years later, in 1874, it became a “mother church” instead of the Matrix of St. Matthew (which was closed ). In 1986, the title of Saint William the Hermit was added to the name of St. Ignatius. Also in this case, as for the previous church, the historical information about this church, I read them on the cosmoibleo.com website.